For more information on powder coating, please click the button below. Powder coating differs from conventional wet spraying in that it is applied as a powder. This powder is charged with static electricity and the work piece earthed enabling the charged powder to be attracted to the work-piece. This also facilitates the powder being drawn into the small and sometime more inaccessible parts of the work-piece offering a complete coverage. Preparation. 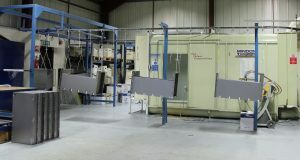 The products to be powder coated must be clean and free from contaminants which may affect the powder coating process. This is done by removing loose surface parts or rust by either sand blasting or rubbing with emery cloth prior to thoroughly de-greasing the work. This part of the powder coating process is probably the most important as if the surface is not thoroughly cleaned the resulting finish will be compromised. 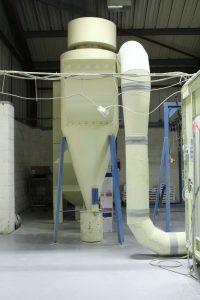 Following this preparation, the work will be oven heated prior to the powder being applied to ensure there is no remaining moisture prior to the powder coating process being carried out. Adding to the line. Once the products are ready to be powder coated they are added to the line. This is an automated track that moves the product through the paint booth and the oven. Products are suspended from this line by metal hooks. These hooks are connected to the product in a none conspicuous area to ensure the visible areas of the product are to the best quality. This line can be set to move at a range of speeds depending on the complexity of the part that is being coated. The track speed must such that it allows the work-piece to remain within the oven for a period of at least ten minutes while at a metal temperature of 220 degrees. This will ensure the powder will be correctly cured. First run. Often, as mentioned above once the products have been added to the line, they pass through the oven before being painted. We do this to burn off any additional contaminates that may have been missed during the preparation stage. The heat reaches areas we sometimes cannot. Painting. 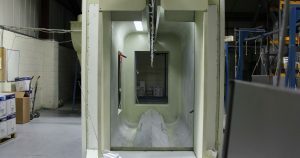 Once the products have been added to the line, and passed through the oven, they pass through the powder booth again. Here they have the powder coating applied. This powder coating is applied using a static gun. This gun applies a static charge the powder typically 50,000 volts. This static charge attracts the powder to the oppositely charged product and ensures the powder adheres to the product. The process creates an even covering of powder to the product, even in hard to reach areas. Curing. 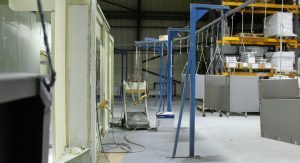 Once the product has been coated in powder, it is transported along the line and in to the oven. Here the powder and product are heated causing the powder to bond permanently to the product. The oven is usually at a temperature of around 200 degrees Celsius and the products pass through for around ten to fifteen minutes in order for the powder cot cure correctly. Unloading the line. Once the products have passed through the oven and the powder is cured, the products arrive back at the start. Here they are removed from the line and packaged ready for assembly or dispatch. The unloading of the line is done at the same point as the initial loading of the line creating a constant flow of work to be painted. The advantages of using a constant moving line to powder coat are numerous. Most notably the movement is smooth and linear, and there is little human contact. In the time between the powder being applied and it curing there needs to be as little jolts or human contact as possible. Any bumps or jolts or scuffs will remove powder causing the end finish to be deteriorated.